After staying at the Homewood Suites Dayton-Fairborn (link goes to trip report), we took a trip over to the US Air Force Museum. Museum opens at 9 so we were trying to get up and out of there in time to get there about then, but we don’t always move super fast :-D.
It was about a 10 minute drive from our hotel, and luckily we got there before it got too crowded, as the parking situation was dicey. Normally they have plenty of parking, but due to all the snow we’ve gotten, much of the parking lot had not been plowed. We ended up taking one of the last spots in a line of cars that was TOTALLY not in a real parking spot. 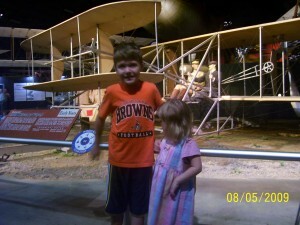 The museum is your basic museum, focused on aviation history, specifically on military history. The part that I find the most interesting is the early history of planes. 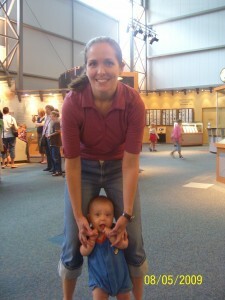 That MAY be because by the time we get much past that the kids have kind of had it with the museum, so we leave :-). We had actually been there a few years ago, so we tried to recreate some of the photos. Here is one of them. One of the things that the kids most enjoyed about this museum was an exhibit where you had an airplane and had to “land” it on a carrier by catching its tailhook on one of the lines. Sorry for the grainy picture – annoyingly we forgot to pack the camera so these pictures were all taken with the iPad :-/. Overall it was a fun little mini-vacation – after we finished up at the museum we drove on down home for lunch.